Transport Mutual will be closed over the Easter holiday weekend (Good Friday to Easter Monday, inclusive) and on the ANZAC Day public holiday. Internet Banking and Telephone banking will be still be available during this time. The staff and management would like to wish you a safe and happy long weekend. 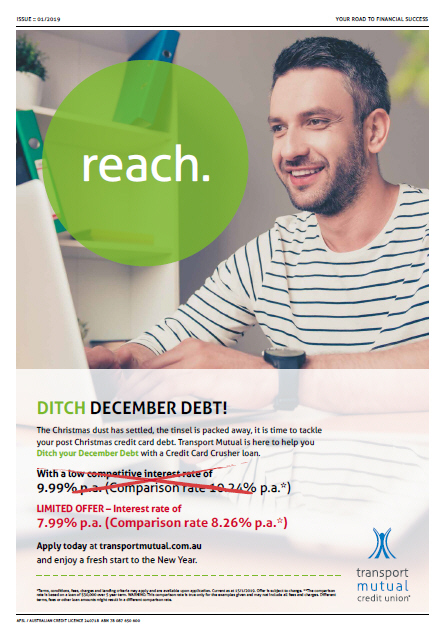 Why is TMCU increasing its home loan variable interest rates when the RBA has not changed the cash rate? How does this change impact me and my repayments? If you have a variable home loan with us, your interest rate will increase by 0.12%p.a. For many borrowers, there may be no impact as they have chosen to keep their repayments high over this extended low interest rate period. Before making any changes to your repayments, we’ll send you a letter telling you what your new repayments will be, and the effective date of that change. Please review your current direct credit deposits to your account to ensure they are sufficient to cover any required loan repayment increase and any other payment requirements you may have. If you pay by any other method, please adjust your payments accordingly. If you have an amount available for redraw on your loan and you do not wish to increase your loan repayments to the new minimum amount please contact us to discuss your options. Any additional repayments will continue unless you wish to make other arrangements. I want to adjust my repayments, how do I do that? Please contact us on 02 8202 8555 to discuss your options. My loan is split with a fixed and variable home loan. What does that mean? Only the variable portion of your loan will be affected, and your interest rate will increase by 0.12%. There are no changes to your fixed home loan. Attention members, there is currently an SMS phishing scam targeting credit union members. If you receive an SMS similar to this one please delete as it is not legitimate. Cuscal: Your account was locked and requires additional verification.